This whole dish started out pretty random. I was heading to work out and already thinking about lunch. A sweet potato sounded really good and then I thought why not sweet potato noodles? I wanted a raw dish, but didn’t want the starchy texture that raw potatoes can have. So the idea to boil water and let the noodles soak in it while I worked out was born. Using our handy little electric tea kettle I got the water boiling and set the noodles up in their bath while I sweated on the elliptical to TV on the Radio and MGMT. Win! About a half hour later I drained the noodles and whipped up the sauce. This was a super easy and filling lunch. You could absolutely make this in the morning before work and have it as a cold salad instead of warm. Feel free to add extra veggies from whatever you have on hand. The warm ‘bath’ I gave the noodles worked out really well. It eliminated the starchiness and brought out the sweetness that usually only baking does, and also left them nice and crunchy. I crack myself up because I’m already thinking of what toppings I could use next time. A sweet one with cinnamon, nutmeg and maybe a little walnut oil. Even a spaghetti sauce would be great on these noodles. Here’s the recipe, I hope you try it and let me know what you think. Warm and crunchy sweet potato noodles paired with an Asian themed sauce. Place noodles back in the bowl and drizzle with 1 teaspoon of olive oil then mix in onion. 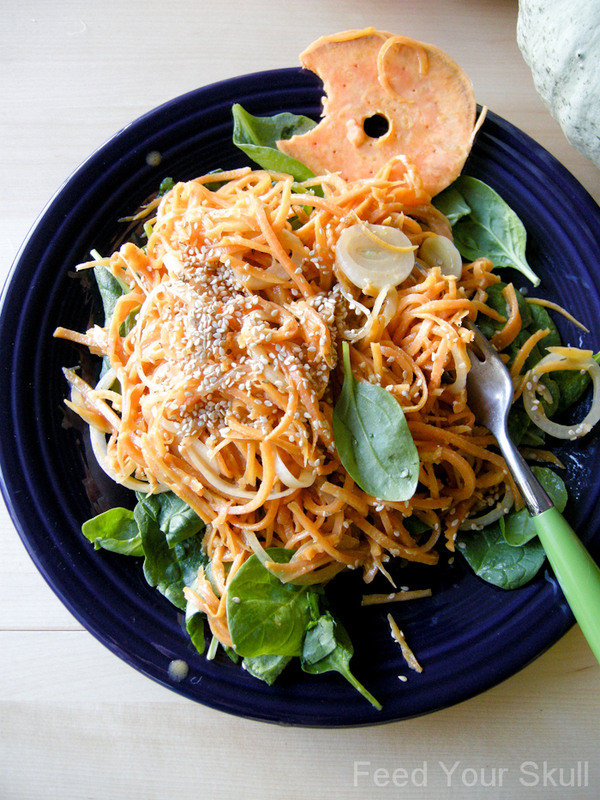 Pour dressing over sweet potato noodles and toss to coat. Serve over fresh baby spinach. 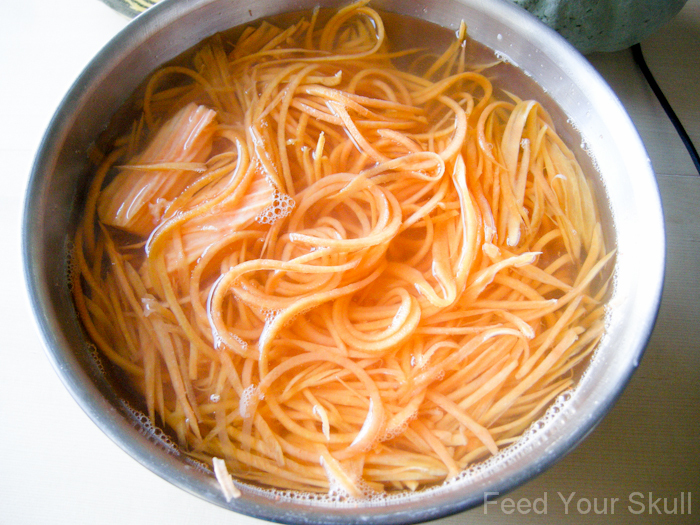 Have you ever tried sweet potato noodles? This looks fantastic! I will definitely give this a try. Beautiful pictures too. Thank you so much Jodi! I made a sweet version for breakfast today and it was so good. I’m really liking the hot bath for the noodles. This. is. so. good. Making it for a second time tonight. I like a little less crunch to my sweet potato so I sauteed mine to soften a bit more and I left out the onion as I am prego & didn’t want heartburn. Also used yellow miso. Yum!!! Thank you Celina! 😘 I’ve been obsessed with it lately too and absolutely agree with the warmer/softer sweet potato noodles-it’s so cold here. Glad you’re loving it!